The perfect pairings. The Cheese Lady offers a wide variety of wines to compliment an array of cheeses. View each location’s wine list below. Please note that this may not be a complete selection and not all locations offer wine. If you are looking for something specific, contact us today. Rule #1: There are no rules, eat and drink what you like. But if you yearn for a more organized and regimented approach, here are a few ideas to consider. Like food pairings, matching wine with cheese can fall into two categories: complementary or contrasting. Big, sharp, nutty cheeses paired with big, bold wines or mild, fresh cheeses paired with delicate, light bodied wines are both examples of complementary choices. Think mild with mild, wild with wild. Pairing an acidic or sparkling wine with a decadent triple-cream will cut through the über-creaminess of the cheese and sweeter wine will smooth out the salty, pungent edge of strong blues. These are examples of contrasting flavors. They both work, it just depends on what you want to experience. Try complementing styles one time and contrasting another. Experimenting with these concepts will reveal just how versatile and fun pairings can be. Pairing cheese with wine from the same area is always a fun way to experience flavors from around the world. Think Spanish cheese with Spanish wine, French with French and so on. This concept can be broken down even further into more localized offerings. Goes with where it grows is a classic pairing technique that will really expand ones knowledge of regional cheeses and wines. The following list represents some wines that The Cheese Lady carries along with suggested cheese pairings. Our wines sometimes change and so do our cheeses, so have this chart as a guideline and use the information to help you explore things that you might not otherwise consider. Remember, it is wine and it is cheese – and even though we take them both very seriously, you shouldn’t. The most important thing to remember is to have fun. Sip….taste….savor….and enjoy! This French red is well balanced with generous fruit flavors and soft tannins. It is a blend of primarily Grenache with some Syrah and Carignan added. Can stand up well to blue cheeses and pairs great with pastas and red meat. A German treat to be savored with sweet and nutty cheeses like Bella Vitano or Midnight Moon. Its lively, fruity, and spicy with the perfect amount of floral accents. A lovely Italian red made of ancient vine grapes of the Puglia region. It is intense on the nose, full bodied, and massive in character, making it a perfect match for our aged Italian Piave Vecchio, what a great couple. 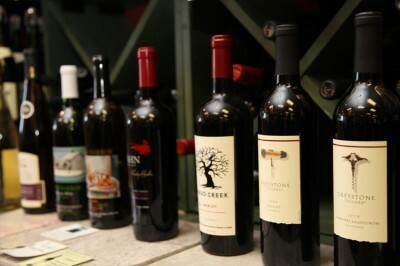 Our Boutique Wine Selection has a variety of domestic, imported, and local wines. Mas Amiel Cuvee Special 10ans.